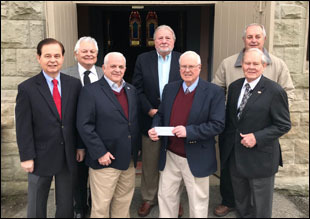 The Monongahela Cemetery Board of Directors would like to thank the 248 individuals and businesses who have donated to the Chapel Restoration Fund to date. Please check our website to see the growing number of donors. Learn more about how you can help us. Monongahela Elks Lodge 455 donated $1000 to the Monongahela Cemetery Restoration Fund. 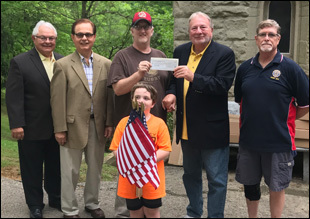 Stanley J. Welsh, Elks National Foundation Local Chair & Lodge Secretary presents the check to John S. Cattaneo current Vice President and Secretary of the Monongahela Cemetery. 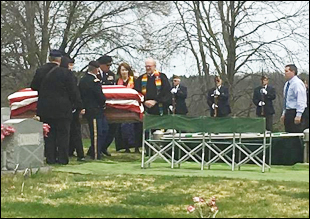 The Board of Directors of the Monongahela Cemetery accepted a bid from Yohe Roofing to replace the roof on the Cemetery's Chapel with a slate roof as part of the Chapel Restoration Project. Pictured from the Monongahela Cemetery are John Cattaneo, James McCune and Richard Bucchianeri. Tom and Mark Yohe of Yohe Roofing were also present. 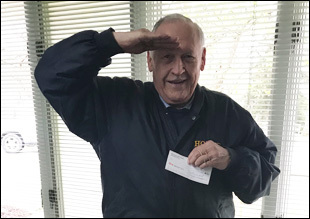 Before decorating the Veteran's graves for Memorial Day David Thompson, Jr., Commander of the American Legion, Frank Downer Post 302, makes a donation to the Monongahela Cemetery Chapel Restoration Fund. Standing in the back row left to right Roger D'Emidio, Richard Bucchianeri, David Thompson, Jr., John Cattaneo, and Stuart Isaac of American Legion Post Frank Downer 302. In front is Alex Thompson. 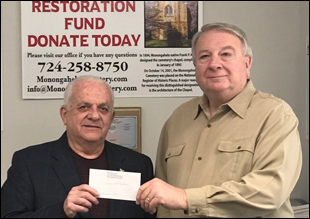 Frank Lomago from the Mon Valley Honor Guard and Firing Squad makes a donation to the Monongahela Cemetery Chapel Restoration Fund. Monongahela Elks Lodge 455 donated $1500 to the Monongahela Cemetery Chapel Restoration Fund. Stanley J. Welsh, Elks National Foundation Local Chair & Lodge Secretary presents a check for $1500 to James P. McCune, President of the Monongahela Cemetery. 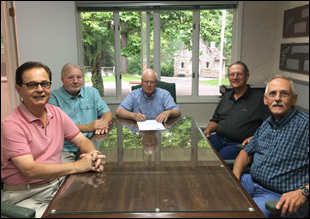 Also, pictured is the current Board of Directors of the cemetery, left to right, Richard Bucchianeri, Stanley J. Welsh, James McCune, Will Maurer, (Second row), Roger D'Emidio, Jack Cattaneo, and Alan Veliky. Ensure your loved one is memorialized this summer with Seasonal Adornment Services. Your family member's grave will be dressed with a beautiful selection of live flowers that will be cultivated and maintainted by our staff throughout the entire summer season. Give the gift that will memorialize your loved one and last through the ages. Consider purchasing Perpetual Adornment Services. A one-time fee ensures your loved one is memorialized for years to come with perpetual floral cultivation by our skilled care-takers. Established in 1863, The Monongahela Cemetery is revered as one of Pennsylvania’s most serene and beautifully landscaped cemetery facilities. 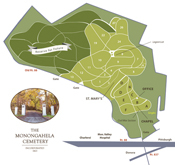 The Monongahela Cemetery offers a wide-range of services and products, including Pre-Need Planning, Memorials, and Burial Services. Our friendly and caring staff will take the time to walk you through the planning process and diligently work to meet your family’s special needs. 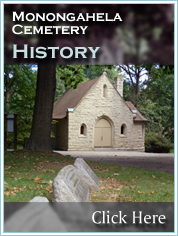 The Monongahela Cemetery is honored to be recognized as a National Registered Historic Site. This unique classification is testament to our commitment to historic preservation and community involvement. We are dedicated to the generations who have selected our cemetery as their final resting place, and we continue to provide them with a serene, well-kept environment till the end of ages. Full or Part Time hours available, must have a valid PA driver’s license. $12.00 per hour, approximate start date April 8, 2019. © 2019 Monongahela Cemetery. All Rights Reserved.